Frog-mouth Helm, was primarily used by mounted knights for tournaments (jousting) rather than on the battlefield. Frog-mouth Helm, Great pelvis open field characterized by the peak angle in the middle and protruding. During jousting tournaments, the helmet offered a better degree of protection from lances that would splinter after impact with the rival's body armour. 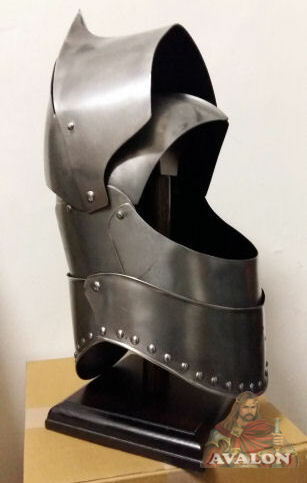 Early examples of the stechhelm were made from a single piece of metal, while later dated helmets had hinged constructions that could be disassembled. The frog-mouth helm the helmet was primarily used by mounted knights for tournaments (jousting), it was a type of great helmet, which dates back to 1400 and lasts until the first quarter of the sixteenth century. The analogy with the frog's mouth was drawn by the way the ocularium (the fissure through which the wearer could see) resembles the open mouth of a frog. - High quality replica of the original on display. - Weight: 6.9 lbs (18 gauge). 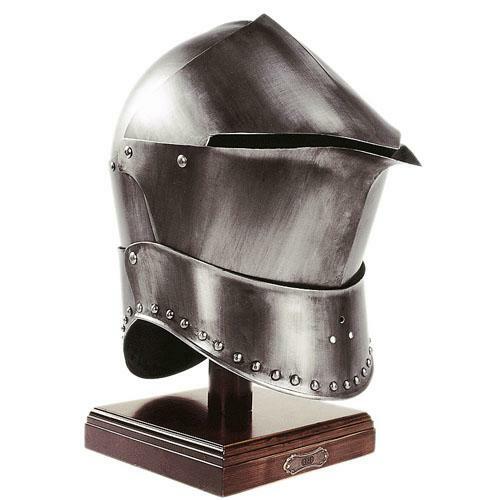 Frog-mouth Helm armour is produced by highly skilled artisans in Italy.